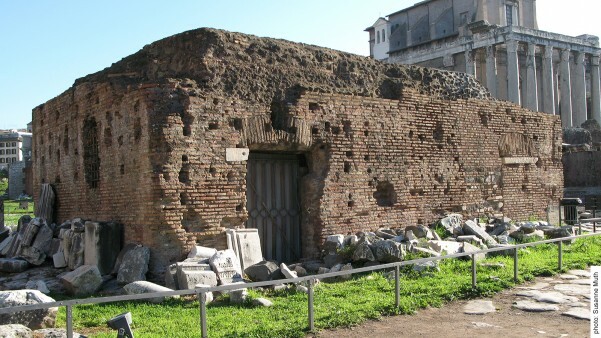 The present-day ruin of the Rostra Diocletiani exemplifies the complex and tragic history behind several of the structures on the Forum: During the excavations in 1874, the remains of the speaker’s platform were interpreted – incorrectly – as dating to the medieval period, resulting in its demolition, which had until then been preserved in good condition. Because the excavators were much less interested in those epochs after antiquity, it was common practice to simply remove the ruins which they believed to belong to such a time period without any further documentation. In the case of the Rostra Diocletiani this is most unfortunate, because the construction of the monumental structure led to a profound change in the visual appearance of the Forum during the Tetrarchy. This transformation can no longer be understood in the context of the present-day excavation site, in which the ruin is virtually invisible. 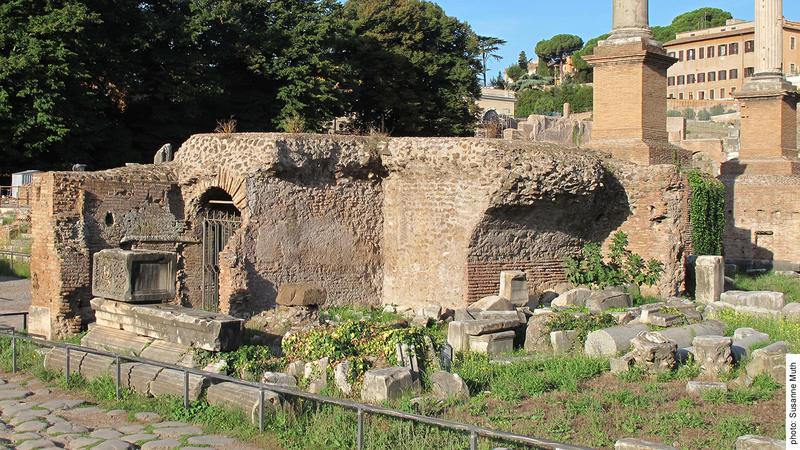 At first, the identification of the remains of the Rostra Diocletiani, which delimit the paved area of the Forum on the east side, posed a problem for scholars. 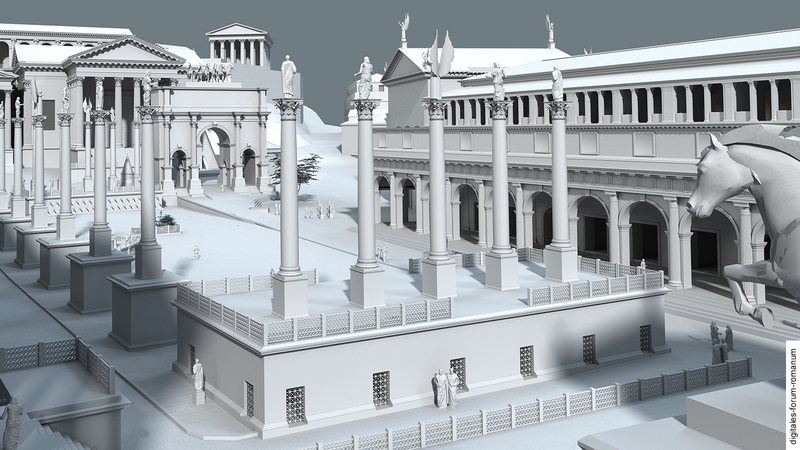 One view was that the remains should be interpreted as tabernae due to the spatial configurations within the structure; another view was that the remains should be identified as the stationes municipiorum (the assembly building where the inhabitants of the municipia, which were located outside of Rome, would collectively vote), which the literary sources describe. 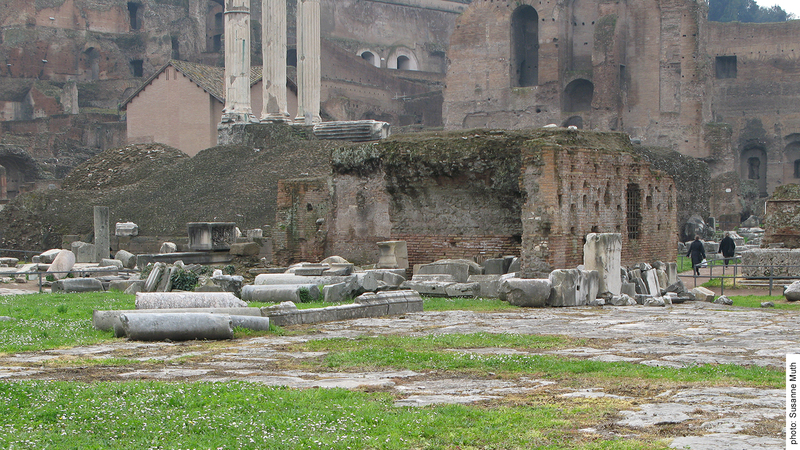 In 1979, further foundations were excavated in the north-east part of the Forum area, enabling a definitive identification of the structure: The structural elements belonged to a speaker’s platform, which covered the entire east side of the open Forum area; this platform was so similar to the Rostra Augusti, which were situated opposite on the west side, in scale and appearance, that many scholars have understood the structure as a deliberate “duplication” of the Augustan speaker’s platform on the west side of the Forum. The structure can be dated to the end of the 3rd century A.D., based on several brick stamps naming the Emperor Diocletian. 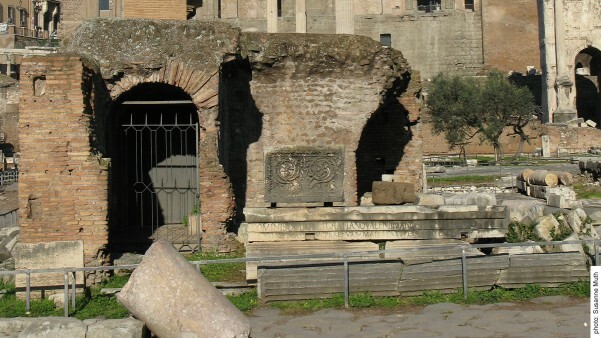 The combination of two speaker’s platforms, one on the east and the other on the west side of the Forum Romanum, had already existed since the Augustan period: At that time the newly constructed Rostra Augusti on the west side and the speaker’s platform in front of the Temple of Caesar were engaged in dialogue. However, it is difficult to assess whether both were utilised simultaneously and hence perceived in combination with one another in everyday life on the Forum during the subsequent centuries. In turn, this makes it hard to reconstruct the motives behind the construction of the Rostra Diocletiani: Was it a conscious decision to enter into the old dialogue between the speaker’s platform in the east and the west by replacing the old Rostra at the Temple of Caesar with a new one? 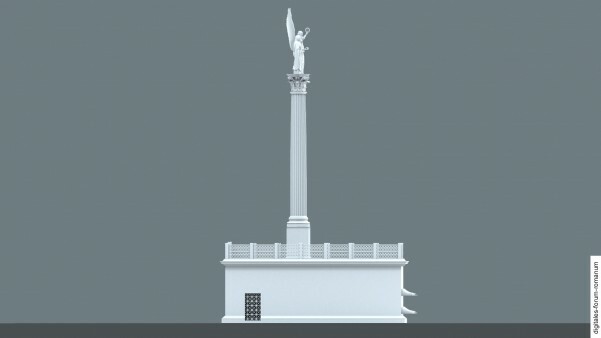 (Some scholars have even proposed that the speaker’s platform at the Temple of Caesar was destroyed by a large fire in 283 A.D. and that the Rostra Diocletiani was built in order to replace it – however, the remains of the Temple of Caesar provide no substantial evidence of this fire, so that this seems like a moot point). Or was the Forum entirely rethought under Diocletian as a space of political representation, resulting in a new form of monumental construction on the east side. The fact that the Tetrarchs were strongly interested in exploiting the Forum for their own, self-representational purposes becomes evident when examining the reconfiguration of the Rostra Augusti that occurred simultaneously on the west side: There, an impressive monument with five columns was erected on the speaker’s platform (this monument was either the modified version of an older Severan monument or a new structure), in order to celebrate the new political system. 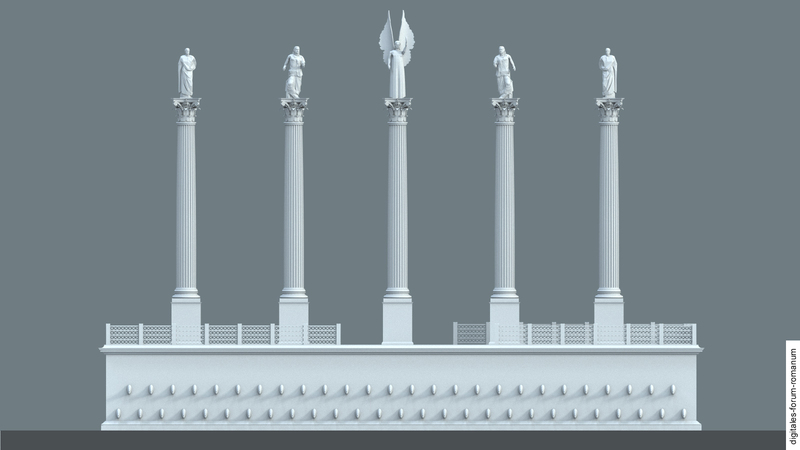 A similar monument with five columns probably also stood on the new Rostra Diocletiani, conveying an analogous, prestigious claim. 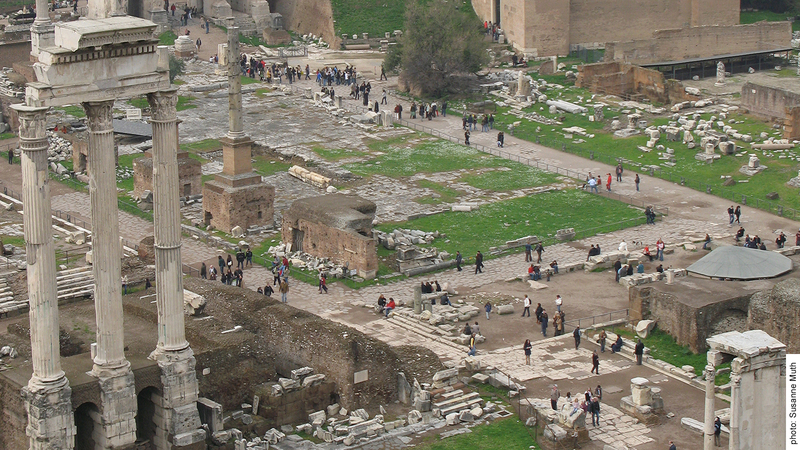 Both speaker’s platforms, with their towering column monuments, bordered the actual open square of the Forum and defined it as the stage of the glorious present (see Tetrarchic). Similar to other construction projects in the Tetrarchy, the structure was composed of bricks. At an earlier stage, the structure had also been magnificently faced with marble (remnants of the marble profiles from the base as well as the cornice have survived). 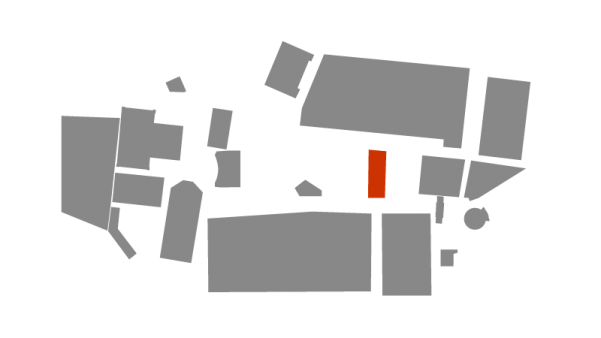 Based on more recent excavations in the 1980s, the area of the structure has been estimated at 12 x 30 m; the height of the building (3,90 m) could be precisely determined on the basis of the preserved south corner. 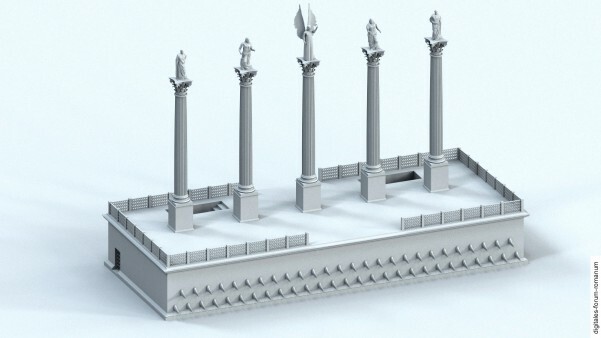 Analagous to the Rostra Augusti on the west side, the Rostra Diocletiani should also be reconstructed with five column monuments. Here, the free spaces for the foundations of the monuments have survived in the internal configuration of the structure. Several rooms were located inside the structure and could be accessed from the west side (Forum) and east side (road). Similarly to the Rostra Augusti on the west side, the Rostra Diocletiani still has traces of small openings on the side that faces the Forum. These openings have been interpreted as the place where the naval rams (so-called rostra) were affixed. From a historical perspective, however, scholars have not been able to plausibly associate this construction project with a specific naval victory. It is also possible to interpret these small openings within the context of the magnificent marble incrustation from earlier construction phases. Finally, due to the later usage of the structure, it is very difficult to date these small openings precisely. It cannot be ruled out that these openings were added some time after antiquity. During the excavations in 1874, large parts of the Rostra Diocletiani were torn down without any documentation and in spite of the good condition of the structure, because it was assumed that it was in fact a medieval tower. 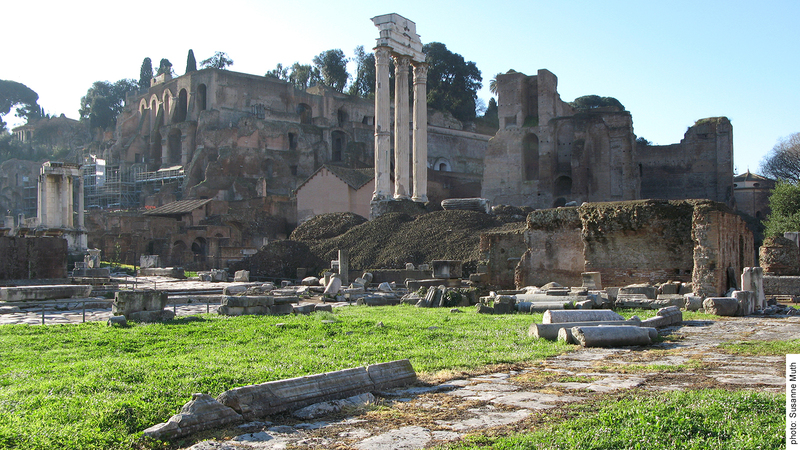 The excavators were not focused upon the construction phases of the Forum Romanum that came after antiquity, which is why visitors of the present-day Forum experience the space nearly entirely free from medieval structures. Fortunately, the southern part of the structure was not torn down at the time, because it was assumed that this belonged to the seven honorary monuments, which spread out across the south side of the Forum. Large sections of this structure have survived (up to the height of 3,90 m). They constitute the most important evidence on which to base a reconstruction of the rest of the structure. In the 6th century A.D., the Rostra were used as workshops, where for example the old metal that could be found everywhere on the Forum was processed. Because more and more material was being piled in this area, the structure was abandoned in the 9th century A.D. At the present day the only room of the former speaker’s platform that has survived serves as a depot. F. A. Bauer, Stadt, Platz und Denkmal in der Spätantike. Untersuchungen zur Ausstattung des öffentlichen Raums in den spätantiken Städten Rom, Konstantinopel und Ephesos (Mainz 1996) 31-32. F. A. Bauer, Stadt ohne Kaiser. Rom im Zeitalter der Dyarchie und Tetrarchie (285-306 n.Chr. ), in: T. Fuhrer (ed. ), Rom und Mailand in der Spätantike (Berlin 2012) 57-65. F. Coarelli, Il Foro Romano II. Periodo repubblicano e augusteo (Rome 1985) 318-324. C. F. Giuliani – P. Verduchi, L’Area Centrale del Foro Romano (Florence 1987) 148-166. 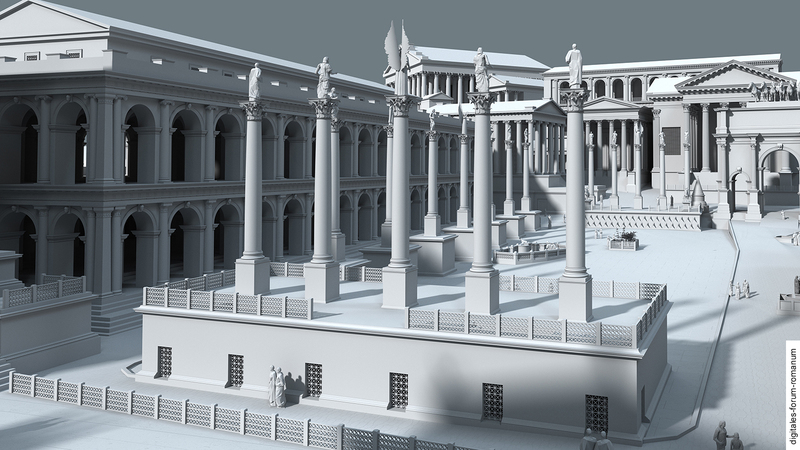 H. P. L´Orange, Ein tetrarchisches Ehrendenkmal auf dem Forum Romanum, Mitteilungen des Deutschen Archäologischen Institutes. Römische Abteilung 53, 1938, 1-16. P. Verduchi, Le tribune rostrate, in: A. M. Bietti Sestieri (ed. ), Roma. Archeologica nel centro. Convegno Rom 1983 (Rome 1985) 29-33. P. Verduchi, Rostra Diocletiani, in: E.M. Steinby (ed. ), Lexicon Topographicum Urbis Romae (Rome 1995) 217-218.